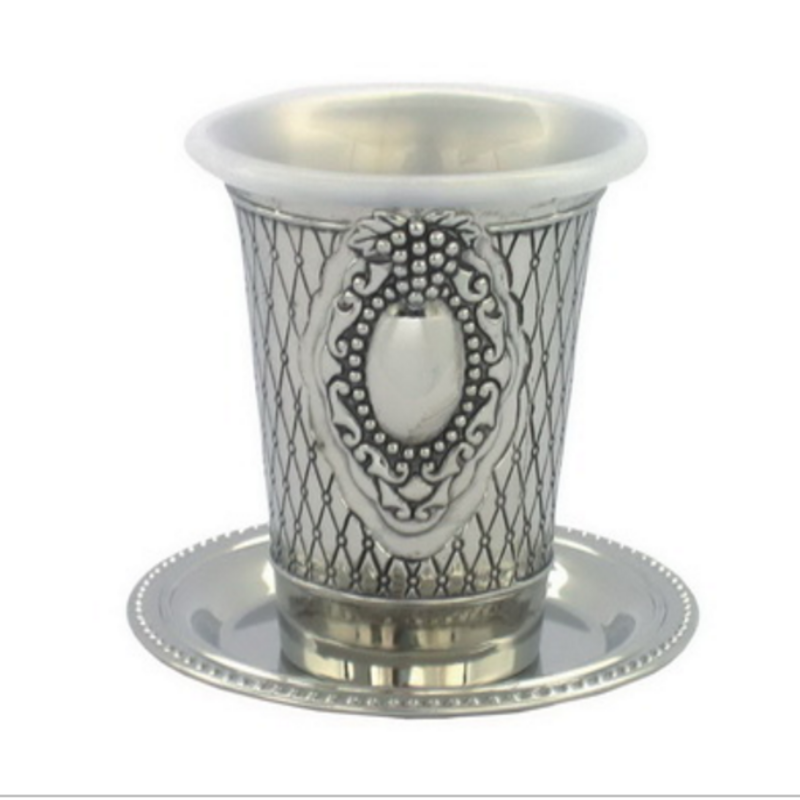 This nice silver plated Kiddush cup with saucer will suit perfectly every festive table for Shabbat and Jewish holidays. Its surface is covered with crosshatch decoration and the central place has a traditional motif of grapes and finely elaborated ornament. Kiddush cups have always had special meaning and place in Jewish home. This sterling silver Kiddush cup is a nice example of traditional piece of Judaica utensils, aimed to serve in the special moment of blessing over wine. The cup is made of metal, it is silver plated and finely decorated. The surface of the cup is covered with crosshatch decoration, and the central place has a traditional motif – oval form with incorporated motif of grapes. The cup is completed by simple silver coloured saucer. Let your table for Shabbat and holidays mirror the significance of the moment. Perform the blessing before meals and recitation of the Kiddush over this special Kiddush cup. For easier maintenance, the Crosshatch Kiddush Cup has a plastic insert that may be removed for washing.